The MCC Girls Golf team has started the season 4-0. 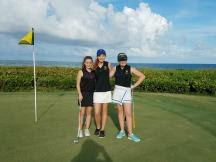 The defending District champions have been led in scoring by team captain Elise B., Marissa K., Keara H. and Delaney G. Maya S. (UTP-Germany), the program&apos;s first international student golfer, is adapting to the golf courses of Florida, and is also contributing to team scoring. Captain Camille S., Natalie I., Destiny W., Sabrina K. and Alana K. are other members of the team contributing to scoring.